는 광해군 5년(1613) 3월에 임진왜란 당시 광해군을 호종하는데 공을 세운 承憲大夫 錦山君 李誠胤에게 내린 衛聖功臣敎書이다. 위성공신은 광해군이 폐위된 후 削勳되었다. 그 결과 구체적인 내용은 실록을 비롯한 모든 기록에서 삭제되었으므로 인적사항 등 자세한 사항이 전하지 않고 대강만 알려져 있을 뿐이었는데 본 교서를 통하여 알 수 있게 되었다. 현재 지정된 위성공신교서는 보물 제494-2호 정탁, 보물 제1306호 유몽인이 있다. 이 문서는 광해군 때 공신에게 내려진 교서의 형태를 완벽하게 간직하고 있으며 뒷면에는 製進者 및 書寫者가 밝혀져 있어 교서의 양식과 문체의 연구에 중요한 자료로서 가치가 높다. 함께 보관된 는 1669年(현종 10) 8月 24일에 錦山君 李誠胤에게 承憲大夫(정2품)에서 興祿大夫(정1품)로 올려주고 忠貞의 諡號를 내리는 贈諡敎旨이다. 『顯宗實錄』顯宗 10年 8月 24日 甲申條에 “故 錦山君 李誠胤에게 忠貞이란 시호를 내렸다”라 기록되어 있어 贈諡한 사실을 증명하고 있다. 교서와 교지 외에 이 가문에는 號牌와 牙笏이 전한다. 한 家門의 號牌가 150년(1677-1822)간에 걸친 것이 16개나 남아 있는 것은 매우 드문 일이며 호패사 연구에도 중요한 자료가 될 것으로 인정된다. 牙笏은 하나가 있는데, 李徵龜나 李泰龜가 사용했을 것으로 추정된다. 牙笏은 1품에서 4품에 이르는 高位官員이 지니는 것이다. Yi Seong-yun, a royal relative and a major second-rank official, was among those cited as meritorious subjects for their roles in escorting and assisting King Gwanghaegun, then a prince, during the Japanese Invasions in 1592-1598. The awards were deprived after King Gwanghaegun’s dethronement in the coup of 1623. Consequently, all official records about the awards, including personal information about the recipients, were removed from the annals of the dynasty as well as other related documents. Hence the certificates are the only sources of information regarding the awards. Royal certificates of two other meritorious subjects cited at the time have been designated Treasures: one for Jeong Tak, as Treasure No. 494-2; and one for Yu Mong-in, as Treasure No. 1306. Yi’s Certificate has been well preserved in its original condition. It contains the names of the citation composer and calligrapher, further adding to its value as research material for the styles of royal certificates of the Joseon Dynasty. A Letter of Appointment, also handed down through Yi’s descendants, was issued on the 24th of the eighth lunar month in 1669 (the 10th year of King Hyeonjong’s reign), to posthumously promote Yi from the major second rank to the major first, and award him the title Chungjeong, meaning loyalty and fidelity. Hyeonjong sillok (Annals of King Hyeonjong) says in its entry for the same day that the late Yi Seong-yun, Lord of Geumsan, is awarded the posthumous title Chungjeong. The family also keeps resident identification tags and an official tablet. It is very rare for a family to preserve as many as 16 resident identification tags issued over 150 years (from 1677 to 1822). The ivory tablet is presumed to have been used by Yi Jing-gu or Yi Tae-gu. 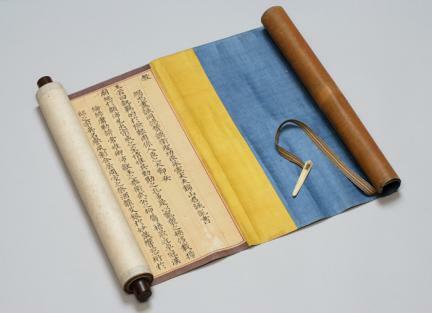 Officials of the fourth rank or higher carried ivory tablets as a status symbol during Joseon.